Here is the invitation Harry and I created for his "Pond, Pumpkin, and Police Party." Harry created the design, placing the elements I made from paper. (I, of course, did the paste and production). Here's the conversation we had about the theme. Q: Why are there frogs on the invitation? Harry: Frogs can be found in ponds at Stony Brook. 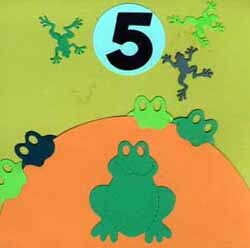 I wanted the little frogs to look like the exploding frogs in The Triplets of Bellville on the top and the bigger frogs to look like they were eating a pumpkin. Harry: Pumpkins are symbol of October and there are lots of them around. I want my cake to be the 3D shape of a pumpkin. Harry: I wanted a third "P" in the theme and right now I'm totally into rescue heros like policeman.